Been gone for a few days. Just didn't feel like creating. I know we all have those days. How do you handle yours? I look for mundane tasks that need to be done and try working on those. Sometimes that will snap me out of a funk, sometimes not. But I will have accomplished some annoying task that needed doing and I'll feel good about that. This time it was the taxes. We run a small business so ours are little more complicated than many, and I do them myself. And celebration time! They are done, filed, paid, complete. So although I didn't create, I did accomplish a major something. Today I decided to tackle the dining table centerpiece. My favorite centerpieces are those that are a little artsy and this one falls into that category. I am growning a small patch of lawn in the center of my table! It all started last Christmas when my daughter Karen gave me a long skinny glass vase for Christmas (Crate and Barrel). 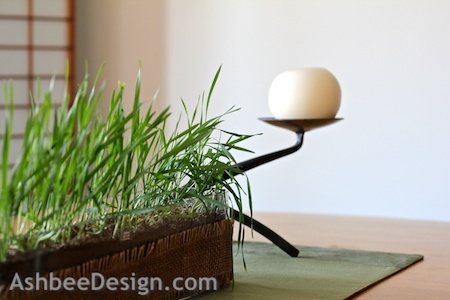 When I saw it, I knew it would be perfect for a wheat grass centerpiece and come mid-March I started. 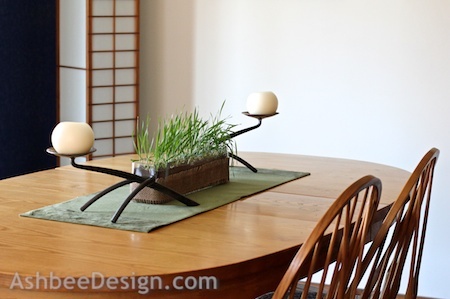 Wheat grass centerpieces require some advanced planning because, according to online sources, it takes about 2-3 weeks to grow. I planted the crop. placed it in a sunny window, and cared for it. I had never tried this before and I wasn't completely successful so I'll share what I learned. 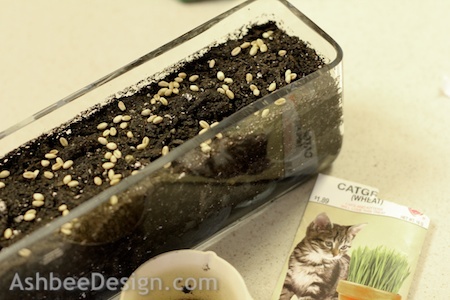 First, I had no idea what type of grass seed to buy but I did find a package of wheat grass for kitties and used that. I think I'd try regular grass seed next year because this grass is a very thick blade. I was picturing something finer. Secondly, I followed the directions which said to plant a sparse layer of seeds and press them into the soil, don't cover them. I snapped a photo showing what I interpreted "sparse" to mean. It was far too sparse. I wanted a thick lawn on my table. Next time - more seed! I watered it well and covered it in saran wrap. Three days later I had sprouts, then shoots. Once the shoots sprouted I removed the saran wrap and hoped for thickening. It didn't happen. I watch and watered for two more weeks. 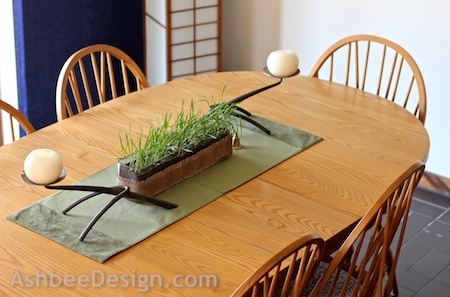 Although the grass isn't what I pictured, today I tried it on my table. Added a couple of hand-forged candle holders and I like the impact... kind of artsy. Having fresh green in the house this time of year is good for the soul, especially in New England. Outside is still brown and gray but the birds have begun to sing!